It seems that every race this season is destined to produce surprises, even the Hungaroring. After Massa shot into the lead from third on the grid and then maintained his lead from Hamilton, it was clear that anything was possible. Hamilton's puncture and drop down to tenth was a minor sensation beside Massa's engine blow up three laps from the end. 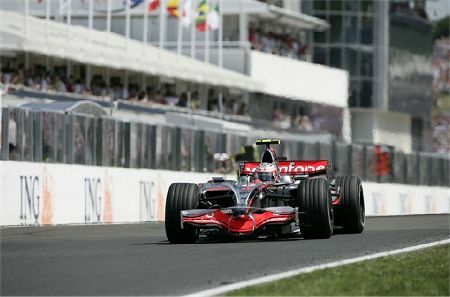 And Kovalainen gratefully accepting the win was the result of looking after his tires more than just luck. He earned it. The enigma has to be Raikkonen's awful form in mid-season. In-car camera shots showed Kimi's car to be much more of a handful than Massa's all weekend and it is possible to accept that the Finn has been struggling to find the best set-up for qualifying. But how does that square with his sudden speed in the last few laps of the race and yet another fastest lap? He mumbled in the post-race interview about mistakes in qualifying and being held up by Alonso in the race, the car coming good on soft tires but there being no way to get by Glock - and I don't believe a word of it. The plain fact is that he was never close enough to Alonso or Glock to have a stab at passing them. Either he has lost motivation or the Ferrari's aerodynamics are so sensitive that the car cannot run behind another car. And, if the handling problems stem from an inability by Kimi to get the set-up right, I must assume that he is not taking a look at Massa's settings. Even Michael Schumacher was not above taking a team mate's settings on occasion (just ask Johnny Herbert); is it pride causing Kimi to self-destruct? I do not know, but the net result is that the rumors of Kimi considering retirement at the end of the year look increasingly possible. The man is as unemotional as usual in interviews but his driving is not that of the Kimi we remember from his McLaren days. It all adds to Ferrari's problems, however. Instead of extending his lead over Raikkonen in the championship, Massa now falls behind, thereby delaying the moment when the team must choose who to back. Do they go for their star, even though he cannot maintain any form at all? Or go for the guy who is behind but getting better all the time? It's a difficult one. McLaren's only problem at the moment must be Massa as well. They were supposed to bring home an easy one-two in Hungary but found themselves in a battle instead. It is no consolation to think that, but for Hamilton's puncture, they would have had their dream result - that annoying Brazilian was the fly in their ointment and they were saved by his engine failure alone. There can be no complacency about a McLaren walk-over in Valencia, thanks to Massa. As for the rest, for the first time Glock showed that he can drive, Alonso fought hard for his fourth place and Piquet continued his improvement. Trulli was uncharacteristically quiet and the BMWs were obviously not on the pace at this circuit. In fact, this was an unusual GP in that most of the action was at the front, rather than in midfield. The Hungaroring may have delivered a reasonably exciting race this time but, as always, I am glad to get it over and done with. I wasn't overly surprised to see Massa set the pace today. His Q2 time was the fastest qualy time by .02 over the entire field. Ferrari seems to be finding all the different ways to lose the races they should be winning. But it certainly makes for a good points battle. Ferrari still has the pace, as Felipe showed today. The last seven races should be very interesting! i've been wondering if kimi's lack of performance (i'm just going to say it here- the kid is not taking any chances at all lately, the start today being a good example) has something to do with massa's good performances. massa's worst enemy is massa and if you know your teammate's really not giving it his best shot for whatever reason...well, massa may really have his eye on the prize -especially if the team isn't making comparisons to his teammate. i'm really starting to think kimi's going to go. what i wonder is, if he's already told ferrari how long can they go without making an announcement? if not alonso, then who could they run next season? maybe fisi's life long dream will be fulfilled before he retires altogether? just joking. maybe. Heikki's performance might have a little to do with it too, as odd as that may sound at a glance. People (and not necessarily race car drivers) that only perform well when they feel like it, especially at something they should otherwise love to do, may have issues that they allow to have an effect on their other tasks, which implies personal issues, or even clinical depression. I've never heard of a race driver talking about needing anti-depressants but to hear Kimi talk, and considering the country he comes from, it might not be far-fetched to think there is something medically wrong with him. kimi's demeanor has never wavered since day 1. that's sort of just the way he is.and as far as his country of origin, and honestly every interview i've seen/heard this year appears to be the most coherent and clear voiced he's ever done-which is what led me to the conclusion that he was feeling pretty relaxed. if you don't like speaking publicly, you end up blabbering. relaxed people blabber less. trust me on that. and if you ever saw a mika hakkinen interview you'd think all finns were just plain strange (i really miss mika). i can't actually recall what keke rosberg was like but i think he may have seemed a bit odd, too. alot of drivers have allowed their head rule their actions but i think it's more a case of their personal passion rather than an imbalance. i swear i could tell when someone had ticked senna off just by the way he held his head over the next couple of laps and he was not immune to the random rash action. i think just by the nature of the job they do and the risks they take there must be a healthy head balance going on there. if kimi is going to retire from f1 before he's in his 30's then really, i think that means he's incredibly well adjusted. how many drivers stay beyond their sell by date because they just can't give it up? even just considering leaving because the negative outweighs the positive even though you could probably take a few more championships and who knows how much more money...that's a guy who gets what he's all about. i think shumacher said he came to that crossroads too and had decided to stay. or maybe kimi's english has just improved. there must be finnish fans out tere who could weigh in on this. I'm sure there are - but even as an English person who knows no Finnish, I would tend towards verasaki's conclusion. He does seem more relaxed - perhaps, if anything, he is too relaxed to get his maximum performance out of himself. In which case don't expect him to leave (he'll be too content in his environment and he's coped with disappointment before) and there may even be a possibility that he'll reach his optimum level of tension after the summer break. However, I don't have anywhere near enough information to make a solid conclusion. I would love to think that Fisi would get to drive for Ferrari during his F1 career, but I seriously doubt that Raikkonen's current problems will provide that opening to him or anyone else. It will probably take something longer-term for the "Vacancy" sign to be put up at Ferrari. After convincing myself over the Hockenheim weekend that Kimi must be retiring to be driving so badly I have gone 180 this weekend. I saw an onboard lap with Massa on Friday or Saturday and he missed 5 or 6 apexes. Just couldn't get anywhere near them. Some were missed by more than 3 feet which is insane. It wasn't his driving the car just refused to turn in and when it did the front end just washed out. Massa's style suits a little understeer where Kimi like Lewis needs the nose to be planted and will happily have the tail wagging. In a car like I saw on the onboard there is no way Kimi can match Massa. I think Ferrari have gone wrong somewhere with their suspension. All weekend they were losing time in sector two which is all long duration corners with quick direction changes between them. In S1 and S3 they were right with McLaren but in S2 they were losing up to half a second. The thing that amazes me is that they looked so much better today but then again I didn't see enough onboard to see how much improvement there was. Had it been handling the way it was earlier in the weekend it would have been trashing its tyres in ten laps. re: Kimi and Glock - I could well be imagining this, but did anyone else think Kimi's car looked exceptionally 'bouncy' over the last couple of laps like an anti-roll bar had broken or something? I deleted the coverage assuming that it would be mentioned on one of the F1 news sites, but can't find anything about it this morning, so can't go back to double check and now I'm wondering if it was just my imagination!! It was just after he dropped back from Glock so I assumed that was why he was suddenly slower. I also noticed that Kimi's comments in the press conference about why he dropped back in the closing laps were rather cagey. Are Ferrari not wanting to admit a second mechanical problem in the same race? I'll see if the highlights recorded and if so if it's got the coverage on there... in the meantime just wondered if anyone else saw this. I am sure I read something somewhere that Kimi hates "doing the press thing" so much that he deliberately keeps his interview replies monotone and dull. Which, I must admit, actually made me smile. Al - r.e. Kimi's bumpiness, looking at some of the on-board stuff towards the end of the race I thought the same thing but assumed a combination of woeful handling (maybe some fix to correct the understeed) or a flat spot.. If I get a chance later I will watch that part of the race again because I wasn't paying much attention to Kimi's car at that stage. Anyone in the UK can watch the race on line at the url below. ITV now hold every race and qualifying session for 30 days after initial live transmission. Al H: According to Kimi it’s not a load of nonsense. I'm late to the party I see - no excuses, everyone needs a day off occasionally! Regarding Kimi's handling problem in the last few laps, the sudden deterioration was noticeable enough to be commented upon by the SpeedTV team - they thought maybe a damper had gone. The Ferrari team statements after the race confirm that there was a problem with the rear suspension in the last few laps and they cite this as part of the reason for their instruction to Kimi to take it easy and just finish the race. They were also worried after seeing Massa's engine blow up, apparently. As for Kimi's retirement, I think he is still undecided. Never mind the excuses about practice, different styles of driving and the roller coaster ride of the Ferrari's handling, what seems clear to me is that this is not the Kimi of old. He has lost something and I reckon it was a pretty important component of his driving, whatever it was. There is no fire to him anymore. And that increases the chances that he'll pack it in at the end of the year. He is not the sort of guy who will continue for long just going through the motions; there are plenty of other things he wants to do in life. Regarding the Ferrari's strange variation in performance, I have decided that it has to be tire and temperature-related. I'll write a post about it today. Good to know I'm not seeing things then! Thanks for the pointers to the official explanation. (And good reminder re: the itv link Steven - thanks).